Sugar manufacturers across the country are struggling due to oversupply and a lack of demand that have forced prices down by VND1 million (USD50) to VND1.7 million (USD80.9) per tonne. A report by the Ministry of Agriculture and Rural Development\'s Information and Statistics Centre said since the beginning of the year, manufacturers had produced 1.03 million tonnes of sugar, a year-on-year increase of 163,000 tonnes. It also added that the stockpiled volume had soared by 142,200 tonnes year-on-year to nearly 530,000 tonnes. The industry estimated that the country needed to import only 200,000 tonnes of sugar to meet domestic demand. Manufacturers, however, said this would be problematic, because this year\'s import quota was 250,000 tonnes, based on predictions made at the end of 2010. But with consumption down, pressure is growing on the sugar industry. In March and April, sales reached just 85,000 tonnes and 72,900 tonnes respectively, compared to around 110,000 tonnes per month last year. Moreover, banks have tightened monetary policies, making it harder for companies to take out loans. As a result, 16 out of 38 Vietnamese sugar manufacturers have already halted production, and a further eight are likely to do so by the end of the month. 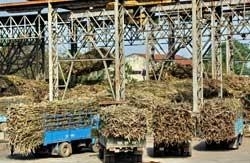 Supply was much higher than demand, and the situation would get worse if more sugar was imported, said Nguyen Thanh Phong, chairman of the Vietnam Sugar and Sugarcane Association. To help manufacturers, the association has asked the Ministry of Industry and Trade to extend the final date for the quota past December 7 for the remaining tonnage that has not already had contracts signed for it. Credit support was also needed to help manufacturers pay overheads and farmers, the association said.